Wow! Now that's one helluva beard. It usually takes me about 5 minutes. You need a laser razor! If you'd seen it before I shaved, you wouldn't be surprised! Blame it on sleep deprivation....Damn kids, waking up early....Nah, I was traveling a lot and my wife likes goatees more than beards, and when you're gone except weekends a man needs all the help he can get, you know? I stopped because honestly, I hate shaving. Approaching $3 million pledged for a razor that probably works a well as the Amega Wand. It's really hard to believe that so many would back an idea with their money without a demo of the product. Some people's confidence in technology seems to be unbounded in an age of having a television set and telephone in our shirt pocket and self driving cars. The downside is that there is so little critical thinking. After years of research & development, they discovered a chromophore in the hair that would be cut when hit with a particular light wavelength. Chromophores are particles that absorb certain wavelengths (colors) of light. This chromophore they identified is shared by every human, regardless of age, gender or race. Yeah, right. Cutting a color producing molecule is going to cut the hair? I put March 1, 2016 on my calendar as a reminder to check the Skarp roll out, but I'm not holding my breath. - it is very concerning when repeated questions and requests for a better demo go unanswered and instead all we get is "look at the FAQ". I would like to up my pledge for this project but what you have shown so far has been totally unsatisfactory to demonstrate you have what you claim. 5) providing excuses for avoiding transparency (patent issues, need a production fiber). 6) making absolute statements (it will shave in one pass close to the skin any hair any color with absolutely no health risk) when you don't have a working prototype so it would be impossible to make those claims with certainty. It is well within your capability to remove these red flags with more transparency - all you need to do is release a better video demo which shows your prototype is actually self contained, actually cutting hair with a laser instead of a hot wire, and cutting hair close to the skin in one pass. Kickstarter policy requires that you actually have a working prototype and all I am asking is for you to show us that you have met this requirement. If I had a revolutionary new technology that was ready for production and there were backers questioning my having a working prototype I would go out of my way to show it off in a convincing demo to address their concerns. If you ignore repeated requests for a convincing demo what are prospective backers to think? The only reason I can rationalize a creator not showing a convincing demo is because they don't actually a working prototype so it's impossible for them to film it in a convincing way. Is that why you aren't showing a better demo? If you have what you say it sure would be easy to put a stop to all these questions and turn all the people who are currently skeptical into vocal and enthusiastic supporters. Why wouldn't you do that? All you have to do to get our support is to give us a better video demo! a) show the unit is self contained (running off a small internal battery and not hooked up to an external fiberoptic cable) by starting the video with the razor sitting on a table top and then picking it up and shaving with the razor (the razor should never leave the screen and it should be shot all in one cut, just zooming in and out at times). b) show it shaving a face (without protective eyewear) by holding the filament directly against the skin and dragging it so we can see that it shaves in one pass - I understand you don't have your production fiber optic filament but we need to see something much more convincing than what has been shown (ie, that it can cut close to the skin and not just one hair at a time). d) at the conclusion show a closeup of the razor head area so we can see that there is only a fiber and no blade and then hold a strip of white paper in front of it so we can see the fiber glow. As someone with a background in experimental optics and laser physics, I'm incredulous. The "scientific" filler footage in the video is extremely sketchy. The footage of "working on lasers for cosmetic and medical purposes" at 0:43 is completely staged and pure theater. The "many prototypes" shown at 1:17 are just different handle shapes -- nothing about what they're doing depends on the shape of the handle. The circuit board being soldered at 1:19 looks too large to fit in the razor. The writing on the white board at 1:25 is just for show. Someone opened a book on optical waveguides and wrote down a few equations. The laser being used at 1:27 apparently puts out enough optical power that the user feels the need to wear eye protection. I would not rub something that isn't eye-safe all over my face. This is despite the claim on the rest of the page that the laser is eye-safe. Most importantly: in the close up at 1:31, the user is carefully directing the output from the optical fiber to strike only his hair and not his skin. The beam is visibly very bright and appears to be burning his hair (despite claims later on the Kickstarter page that the device does not burn hair and is low power). Edit: Wow. Just saw the demo of this thing in action. It's a thin fiber stretched across the end of the razor. Surrounded by air, the difference in index of refraction at the edge of the waveguide is such that the light stays in the fiber. When a hair touches it, the difference in index of refraction changes locally, the light couples out of the fiber into the hair, burning it. Sometimes. It appears to take multiple swipes per hair. I'd also guess that the laser, if it weren't contained in a fiber, would NOT be eye-safe. That's my thought-out reaction. My gut reaction is "holy ****, that fiber is tiny, fragile and likely to break (piping a beam of intense laser light out into whatever random direction it happens to flop)." Edit: Wow. Just saw the demo of this thing in action. It's a thin fiber stretched across the end of the razor. Surrounded by air, the difference in index of refraction at the edge of the waveguide is such that the light stays in the fiber. When a hair touches it, the difference in index of refraction changes locally, the light couples out of the fiber into the hair, burning it. Hey, cool, that's my frustrated-total-internal-reflection guess from earlier. Does it go Kzzznnnwaaarrrgzznnn when you flick it through the air? Send me ten. I have trees need cutting. But where is this nifty video demo? I remember back in the Amega Wand thread, there were copious posts claiming to have witnessed the wondrous cures effected by the thing...even videos of a dog cured of apparent laziness. And what would the mechanism for "cutting" be other than burning or heating of the whisker? Their use of "chromophore" sounds like mumbo jumbo to me. Unless the color molecule is part of the structural strength of a hair, why should cutting it have any effect on shaving it off? I suppose if the fiber were as thin as the edge of a razor blade it could just "cut" its way through like a cheese slicer. This guy might be referring to the video in the Kickstarter article, which is not a demo at all. It's just a cartoon version of the proposed method, which I agree looks like the mechanism of total internal reflection which is frustrated by direct contact with the fiber. Last edited by Olowkow; 3rd October 2015 at 10:37 AM. Over $3 milion with 15 days to go. It just might be time for the magnetic flea repellent collar for dogs. Or a kitty-scratching-post-powered iPhone charger. ETA: I should know by now that making up a ridiculous non-existent item for the purpose of humor is just impossible. I'm guessing the kitty charger has been done as well. 0Bug!Zone is a revolutionary chemical-free way to protect your pets from fleas and ticks, combining cutting-edge science and technology to produce a product that uses electromagnetic frequencies to keep pests away. The odor-free 0Bug!Zone has no odor and uses no harmful chemicals. Just attach the tag to your pet’s collar. A magnetic strip uses a 3-dimensional electromagnetic frequency that combines with your pet’s electrical field to create a protective barrier from pets. It reaches maximum strength within 36 hours of attachment. Protects your pets and family for up to 4 months. Last edited by Olowkow; 3rd October 2015 at 10:54 AM. Kickstarter corollary of Poe's Law? Dude shaving the back of his hand with what looks like a hot wire and green LED. Might take a while. I'll stick with my Mach 3. "Yeah, but he shaves more slowly than growing a beard." Having tried most blade multiples, I'll stick with my trusty double edged safety razor, soap and best badger brush. Until I become a real man and try a cut throat. But is the Skarp sharp?? They glued shark to sharp and added lasers. Mix in a bit of octopus and they can shoot for another mill. Morgan grew up in Sweden and when deciding on a name, the Swedish word for sharp seemed appropriate. Skarp was born. I thought it was a combination of "scam" and "sharp". The question is, "Can it shave?" ETA: I'm getting this as the second hit on Google for "skarp laser razor". Hopefully, this thread might make it into the google search eventually. Last edited by Olowkow; 4th October 2015 at 08:30 AM. Skaap, Afrikaans for sheep, is pronounced the same way. Just saying. Unbelievable. They could easily top $5 million at this rate. 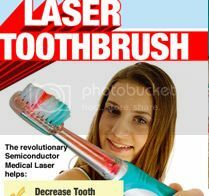 I wonder if it's too late to buy into the laser toothbrush. No toothpaste needed! One of the benefits is supposed to be environmental concerns because traditional disposable razors cannot be recycled. But, this version uses one AAA battery a month. I suppose you can't really win the entropy game. Using a rechargeable would help. Actually it is skarp, for sharp. In Scandinavian languages. One of the guys has a definite Scandinavian accent. Last edited by MRC_Hans; 5th October 2015 at 07:09 AM. Yep I did read the post before mine. I have found it interesting that a number of consumer products, especially those "As Seen on TV!" put an LED or 2 in a poorly made product and claim that it is a new, magical LASER device with all sorts of amazing properties. I think that there is an depilatory device currently on TV with spooky LED lighting that looks to me to be just a motorized cylinder that catches and yacks the hair out of your skin mechanically. But it is "an amazing new technology that is absolutely painless." I guess it is even cheaper to have a Kickstarter campaign and not have this added expense of trying to sell a physical product. Missed this thread so just had a looky. Now, apparently, at over $3million. That in itself is very suspect. After watching the videos.... Scam. Donate if you're a fan of U.S. Infomercials but do not if you prefer reality. ETA: Seems it's a joke. I thought Kickstarter didn't allow that. Also I'm sure you need a working prototype to beg for funds on there. Last edited by ComfySlippers; 5th October 2015 at 11:40 AM. If the had a real working prototype, I'd believe they were onto something. But getting this much effect from a single AAA battery? And doing something with it, that has not been done before in a similar setup? That simply falls in the "too good to be true" category, and my money will stay in the pocket for now! Last edited by Peter i; 5th October 2015 at 11:57 AM. Not sure about scam. It appears to work although shaving with it may be a forth bridge job. By the time you have got to your chin you need to start again at the sideburns..
Nope. No prototype needed. No prototype necessary to get a patent either. That's the beauty of these crowd funding projects. A guy can have a great idea and just honestly feel that he can build it if only he had the funds. Or, you can get a lot of gullible fools to hand over their money on the basis of a cleverly done video. Kind of like Shark Tank without the pesky experts in business to tell you to get lost. There actually does exist a beard trimmer with a laser guide. What happens if the product turns out to be fraudulent? Do they have to refund the money, or can they just take their 3mil and enjoy the rest of their lives (probably somewhere warmer)? I have no special information on Kickstarter, but they make it clear that you invest at your own risk. The use of "fraud" is kind of difficult to apply, since it is very possible that the campaign members are driven by their hopes and by a certain lack of knowledge of the technical problems their idea presents. We might suspect it is a scam, but that presupposes that the perpetrators are aware that the planned item could never be a successful device. Absent clear evidence of their intentions, I am inclined to think some of these claims are just puffing, and a result of naivete. Part of me wants to think that most of the schemes are honest and well-intentioned that show up on Kickstarter. Card games, board games, fancy knives, specialized cables for Apple iphone etc. Plausible projects. Some are dubious or vaguely plausible as to their validity, while others are just nonsense to anyone with knowledge of the field which the device encompasses. I believe the Luminoodle showed up on Shark Tank and has been a very successful moneymaker for one of the sharks. ETA: This is the article on the Luminoodle which was funded by Mark Cuban on Shark Tank, and brought in $120,000 on Kickstarter in a week. It seems to me to be a very practical and reasonably priced device. Cuban asked for 20% of the company at $250,000, cutting the company’s value in half. Light didn’t budge. Instead, he countered with 12% of the company, on top of a board seat and 3% share from the advisor options pool, essentially diluting less of the company. “We got a deal,” Cuban said, walking up to Light and his cofounder David Toledo. Since then, Cuban has worked closely with Power Practical, sitting on its board and helping create a growing business that Light says is generating millions in revenue now. Its latest product, a portable USB lighting product called Luminoodle, has raised more than $125,000 in less than a week on Kickstarter. Last edited by Olowkow; 5th October 2015 at 08:53 PM. According to Kickstarter's FAQ, Kickstarter itself has no involvement after they hand over the funds from a successful project. They claim to have a team that can investigate suspicious activity, so perhaps reporting a scam before the funding period ends might spur action; after that, it looks like Kickstarter washes their hands of the whole thing. Nearly 700 new pledges overnight at roughly $200 each just for the privilege of being one of the first to own an item that is planned to sell for half that? It's not clear why anyone would pledge once the funding goal has been reached. Q: So I'm only charged if funding succeeds? A: Yes! That's part of what makes Kickstarter special. If a project isn't successfully funded, no one pays anything. On the off chance that this thread makes it onto a google search, here is a portion of a good summary of the problems with this project in a link that I have previously posted. For me, it is still the second hit when I google "skarp laser razor". Scam Alert. The wildly successful SKARP "Laser" Razor. Unrealistic technology, no working prototype, but 2.5 million raised. Beware. Laser-based systems for epilation are available for home use. They rely on repeated usage to kill hair follicles, not "melting hair" by targeting their wavelengths for "absorption by chromophores." These claims seem dubious to me. The Skarp picture from the Kickstarter site claims to show two "prototypes with laser turned on". It has been quite properly suggested that one possibility, which is within the realm of physics of fiber optics and lasers, is that this thing could use "total internal reflection" (TIR) to maintain the laser beam within the fiber. Then, when a whisker hits the outer edge of the fiber, the TIR is lost (frustrated), and some of the laser energy is coupled into the hair. Imagine looking into the front of a large glass fish tank full of water. If you try to look through the water at one of the sides which is perpendicular to the front, it will appear to be a mirror rather than a transparent glass panel. This is TIR. However, if you press your hand onto the glass on the side glass panel, you will see just the portions of your fingers/hand which come in close contact with the glass. This is "frustrated TIR". It is the principle that is used for digitizing fingerprints these days without the need for ink and paper. See the wiki link for a picture illustrating this with a glass of water. Now if you look closely at the top "razor prototype", the red light from the claimed laser is clearly visible as is its reflection on the table. The beam is clearly not contained within the optical fiber. A laser with enough optical energy to cut through a beard is unquestionably more than enough to be quite harmful to the eyes, despite the claim by the inventors that there is no problem "because no ultra violet is used". Nonsense. Maybe a class action lawsuit? Provide a realistic sense of where the project stands — including what’s been accomplished so far, and what work remains to be done. Technical drawings, CAD models, and sketches are awesome and encouraged, but photorealistic renderings that someone might mistake for a finished product are prohibited. Projects that involve the development of physical products must feature explicit demos of working prototypes. While you can run a project focused on the creation of a prototype, you can't offer the product that is under development as a reward. New video which attempts to address all the questions. 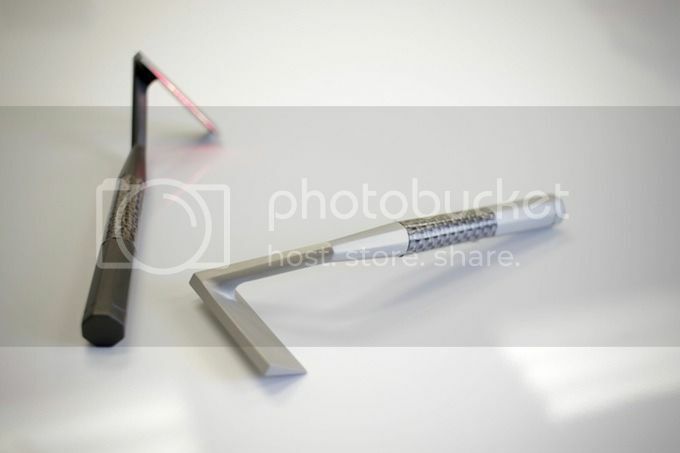 They show a Skarp laser razor supposedly cutting blond hair with no external wires or fibers. Then they show a bench laser with fiber running through the Skarp while admitting that they need the external power supply and laser to make it work. Their engineers are working for free, and it is only a matter of time until they can get it all miniaturized. Very confusing and amateurish explanations. They seem genuinely gobsmacked by the volume of dollars pouring in. Must see. Meanwhile, pledges still keep coming. $3,771,030 as of this post. ETA: From one of the comments. Please don't ever have that man speak in a video again. Or have him take a bump of cocaine first. Last edited by Olowkow; 8th October 2015 at 09:19 AM. If this wasn't a scam/phantasy I'm fairly sure Gillette would have got there first. Followed by the annual "now the best ever, so upgrade" tv commercials. Doubtful, since it would be effectively a one-time, lifetime purchase; and they'd lose the continuous revenue from disposable razors, or replacement blades/screens for electric razors. I do not for a moment believe that the engineers will be able to miniaturize the Skarp sufficiently for a small handheld product like they claim. However, I do believe that if they could get it down to at least a large handheld or small counter-top size there would still be a solid market. (Say, something the size of a first-gen ultrasonic toothbrush, or a WaterPik.) However, this would greatly reduce the portability, which is one of their major selling points. I beg to differ. Gillette sell sharp objects that cut your facial hair. Nothing more, nothing less. Yet every year they tell me they've invented a new and improved version. They make a fortune from fooling gullible folk who believe such nonsense. They resell the same lifetime product over and over to the same people. The market is ready for the iRAZOR. Razors are not lifetime products. Whether they're traditional or electric, the blades dull over time and need to be replaced. The only difference is whether one replaces merely the blade unit itself, or the entire razor. The "new and improved" tactic is done to gain an advantage over competitors, not maintain an existing market. There is very little that they could do with a laser-based shaving system that would justify the high price tag aside from making it smaller and more portable, or less energy-intensive, which is highly unlikely to happen in my lifetime. There are no parts that would be expected to wear out under normal use.